Today we can celebrate the tenth anniversary of my presence on the intarwebs. On this exact date in 1996 I launched my very first attempts at web design. Before I figured this out three weeks ago whilst doing forensics on some very old files, I had been thinking about redoing my website (again) for a bit. The weblog format was getting old, and I really wanted to go back to the olden days of personal websites (for retro is hip). One of the troubles I had was finding stuff to write about. This was a problem because I didn’t really have a subset of topics i want to discuss. Instead of abandoning the weblog altogether, I narrowed my topic choices a bit, using the three sections. The branding is something I’ve been meaning to do for a long time, but never got around to it, until finally, I found a fitting logo. I’ll probably write something about that in the future. Some credits are due. 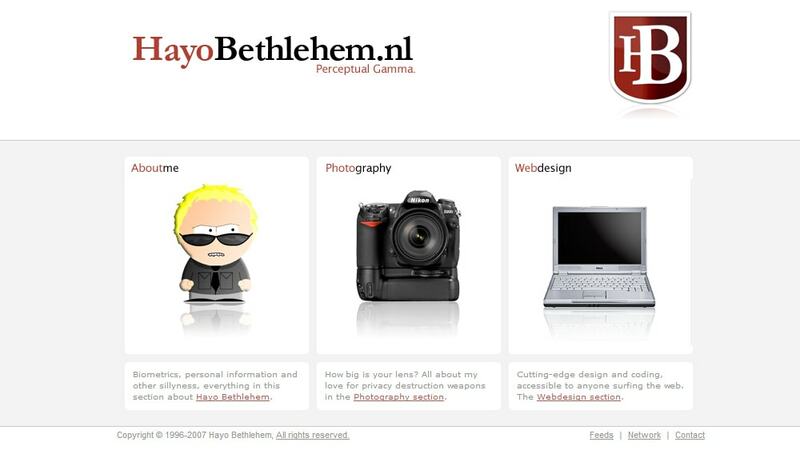 Thanks to Sjors for figuring out some PHP bugs and doing the cute ajax-web2.0-search thing, to Faruk for testing on his employers browser, and all the boys from #xhtml.nl for moral support ;). Oh and let’s not forget Tristan, who kept bugging me to finish the damned thing.